Check out this killer, fourth wall breaking new Deadpool 59FIFTY Marvel Fitted Hat by New Era Cap! Fans of the X-Men’s Merc with a Mouth will definitely want to snag this New Era exclusive release. The Deadpool 59FIFTY Fitted Hat is constructed of a scarlet faux leather with Deadpool’s expressive eyes embroidered on the front of the cap. The Blot’s favorite part of this release is the Deadpool logo on the back of the cap with a thought bubble showing ‘pool dreaming of his favorite snack, a delicious taco! And check out that crazy undervisor and lining featuring Deadpool killing…well…everyone. 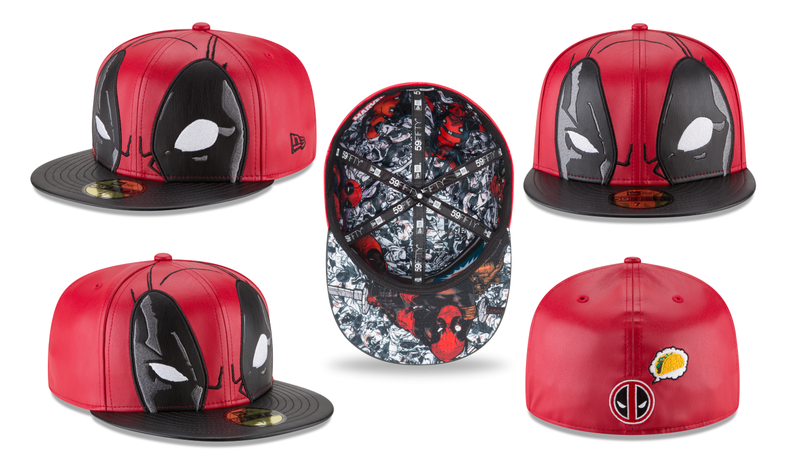 The Deadpool 59FIFTY Marvel Fitted Hat is available now exclusively at the New Era online store, in a variety of sizes, for $55.99 each.